Thanks to Silk for sponsoring this post, and thank YOU for supporting the brands that keep Desserts With Benefits going! All opinions are mine and mine alone. Ask anyone I know whether I like coffee, and they’ll probably laugh out loud and tell you I don’t “like” coffee, I “LOVE” it. But, to tell you the truth, I was never a coffee drinker until I went to college in 2010. After just one month into my very first semester freshman year, I was incredibly stressed and starting to have some serious trouble sleeping. I could fall asleep just fine, but my cortisol levels were whack so I’d wake up at 3am every morning feeling wide awake and ready to start the day. I was never able to fall back asleep, and my schedule made it almost impossible to take naps. Since my insomnia was kicking in full force, I was never late to my 8am chemistry lecture, about a mile walk from my dorm. On my walk over to lecture, I stopped by the mini mart on campus. It was basically like a mini gas station, just without the gas. You got the baked goods, you got the unhealthy snacks and candy bars, and the hot coffee in those giant coffee urns. The scent of freshly brewed coffee instantly hits you the second you walk in the door. I ain’t complaining! Coffee had always smelled great, but whenever I had taken a sip of other people’s drinks, it was incredibly harsh and bitter. But, I really needed to start focusing in my chemistry lecture, and I was tired of being tired all the time, so I went to the coffee station and poured myself a cup. I knew I’d hate it if I drank it black, so I tried to find a creamer. All that was available were those creamers in big jugs with pumps — you know, the ones that are basically pure sugar, hydrogenated oils (aka, dangerous trans fats), and artificial flavors? As a nutrition major with a vendetta against hydrogenated oils, there was no way I was going to put that in my body. I walked through the aisles and ended up getting a vanilla protein shake from the fridge (it was either that or a gallon of milk, which I was most certainly NOT going to carry into lecture and on my mile walk home lol). As a coffee newbie, I had no idea what to do. How much “creamer” do I add? Will it be bitter still? How can I make it sweet and creamy? I sat down, poured some of the protein shake into my coffee, and took a sip. EW. Yep, definitely still bitter. Repeat that probably like, three times, until the coffee is so diluted it’s basically 1 part coffee:2 parts protein shake. But dang guys, it tasted pretty good! And there you have it folks — the beginning of my intense, never-failing love affair with coffee. GUYS IT’S JUST SO CREAMY AND DELICIOUSSSSS. I honestly like it so much that I wanted to use it in something other than coffee. And that’s where these Healthy Caramel Macchiato Overnight Dessert Oats come in! These Caramel Macchiato Overnight Dessert Oats consist of a sweet, coffee-infused oatmeal base and the most perfect topping in the world: coffee creamer + caramel! These overnight oats take just a few minutes to prepare and BAM! Your breakfast is all ready for you in the morning. All you do is stir, cover, refrigerate overnight, and nom nom nom in the morning! 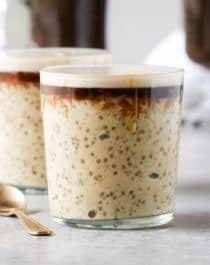 Get your coffee and breakfast in one fell swoop with these sweet and satisfying Caramel Macchiato Overnight Dessert Oats. You'd never know it's healthy! In a large bowl, stir together the oats, chia seeds, sweetener and salt. Stir in the almond milk, coffee, and vanilla extract. Cover and refrigerate overnight. In the morning, drizzle on the creamer and caramel, to taste. Enjoy! Yogurt (dairy yogurt, soy yogurt, coconut yogurt, etc.) or all natural whipped cream/coconut cream can also be used in the “foam” layer! I’ve also tried this recipe using ground flaxseeds instead of chia seeds. It tastes just as good, you just gotta add an extra tablespoon of flax to get the same thickness as the chia seeds. If you’re on the lookout for a new breakfast recipe that tastes BOMB and will keep you full all morning, you’ve sure found it! 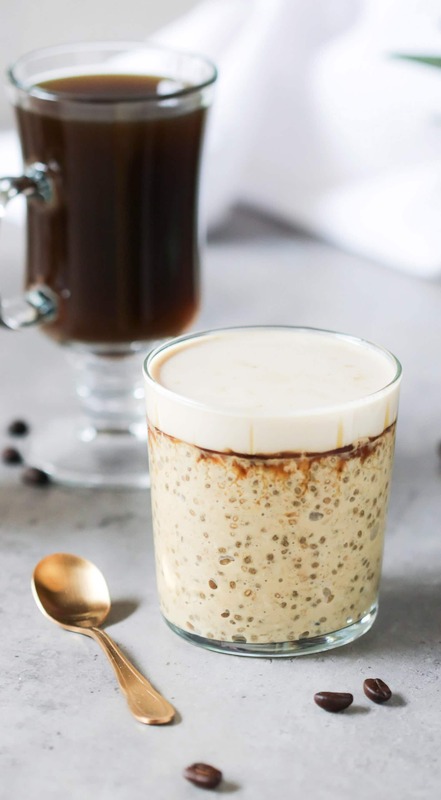 It’s hard to espresso how much I truly love these Caramel Macchiato Overnight Dessert Oats. Wow! It looks delicious! I love the mix of colors! This made my day! Thanks! Coffee to me is honestly………ehhh, I wouldn’t drink it every day, or really, often. But, I do love caramel macchiato flavored treats, such as ice cream or cake! This recipe for overnight oatmeal sounds amazing, and I love that it’s so healthy and vibrant! Can you use old fashioned oats for this? Pingback: How to Make Date Caramel Sauce | Healthy, Vegan, Only 4 Ingredients! I’m the only one in my house who eats overnight oats. How long will it store in my refrigerator? This should last ~5 days or so!